The Fellowship was fortunate enough to obtain a copy of MULAN: REVELATIONS #1 from Dark Horse Comics. 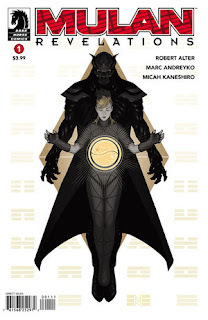 Robert Alter is the creator, with Marc Andreyko writing and art by Micah Kaneshiro. In ancient China, a legendary warrior battles to protect the legacy of a nation and a way of life. Fast forward to the future, a hundred years from now. A tech-based virus is spreading quickly, killing off people with implants (which is now the vast majority of the population). The descendant of the legend, young Mulan, volunteers at a clinic in the slums. When she’s injured by an apparent lunatic, her true identity is revealed to a tech company, sending her on the run. The one thing you can count on from a legendary warrior story is great battles, and once you zap the story forward to a cyberpunk-type future, it’s bound to be epic. Mulan is the namesake of her ancestor, and she may be forced to fight the huge battle like her as well. And given who’s running the tech company, the stakes are definitely running high. The art is really cool, too, with the high level of detail and the cyberpunk atmosphere you’d hope for in such a story. This is the beginning of a great story, built from old Chinese stories (rather than from animated movies). Definitely pick this book up. MULAN: REVELATIONS #1 is available now at your FLCS or at darkhorse.com.